My wife picked this up for me a couple weeks ago, because it's Fall, and she knows I love the various pumpkin spice foods. When she handed me the box, I couldn't help but think that it looked familiar. Going back in my archives, I realized why it looked so familiar; I wrote about these 4 years ago. What a difference a few years make, eh? 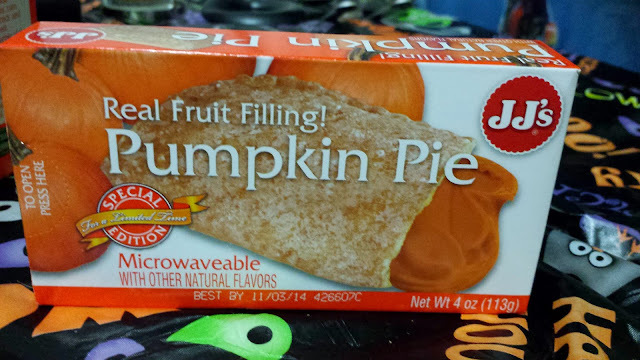 There are a few packaging changes, namely a reduction in the number of pumpkins on the box, and the omission of the "Real fruit filling!". Maybe JJ's is acknowledging that there's as much pumpkin in their pies as there is in a T-bone steak. They've also upgraded from regular old pumpkin pies, to the trendier, hipper pumpkin spice pie. With all these packaging changes, perhaps they've improved the flavor. Maybe? Sadly, it looks like the only thing that's changed is the name. The filling is the same shape, smell, and color as before. And, I'm sad to report, it tastes exactly the same. I will say this one came with an added bonus, ants. Apparently they had found a way to infiltrate the packaging in the week or so it was in our cabinets. Perhaps that's the problem, the ants sucked all the flavor out of the filling. Or, maybe JJ's pies just come with ants, and they just didn't mention it on the packaging. So, I assume they weren't very good? Not particularly. They aren't necessarily bad, but they're just a bit bland.